Every social media network has enjoyed its share of “inspiration” from Snapchat and the most recent one to fall in line is LinkedIn. 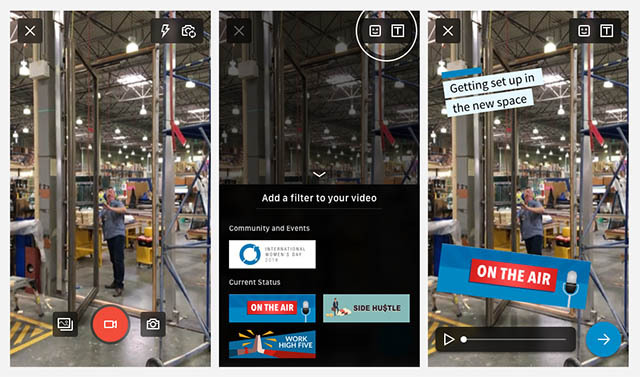 The professional social network, which took some time to realize that video is the holy grail of online content, has now ripped off Snapchat’s filter which can be added as an overlay on top of videos. LinkedIn said it recognizes that videos are shared 20 times more than other forms of content. This is why the network has added geo-filters and text styles for videos. The filters are clearly far behind those available on Snapchat or Instagram using which you can add funny stickers, color filters, GIFs, and face effects. At present, there are only three filters with stickers that you can add. These include a “Work High Five” which should remind you to keep friendships away from the workplace, a “Side Hu$tle” sticker so you can freely talk about the night-time job you’re working to quench a passion your company does not care about, and the last one i.e. “On The Air” which is most likely to be used to make formal talks about growth and motivation appear dandier. Aside from the three filters, LinkedIn had added new text styles for videos using which you can add context to whatever you’re saying. These include common typographic styles such as “FifthAve”, “Geometric”, and “Plain”. The network has also announced that it will continue to add more filters and text styles in future and is likely to use this period to evaluate users’ interest in these additions. Using these filter – if you’re going to – is extremely easy. You can tap on the record icon in the LinkedIn apps, record a video, and you’ll find familiar-looking icons for filters and text in the top right corner. Since there are just three filters, choosing before flaunting one in your video would not be much of a hassle. LinkedIn had introduced special conference badges back in October last year for Grace Hopper Celebration conference which was aimed at celebrating women in tech.